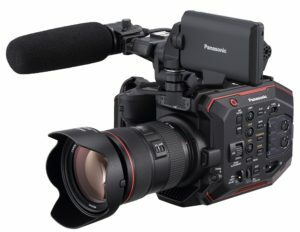 EVA1, Panasonic’s latest compact cinema camera. support for a USB-LAN adapter, allowing IP control. This enabled EVA-LIVE multicam control with the advanced integration of CyanView’s Cy-RCP remote control panel. With the new EVA-LIVE solution, all features supported by the camera are now accessible remotely from the Cy-RCP. Primary corrections – such as white balance, black balance, black levels, master gain and gamma – can be adjusted directly. All exposure parameters are at the user’s fingertips: iris, dual native ISO gains, ND filters and shutter. Advanced corrections such as detail, detail frequency, coring, black gamma, knee, white clip, matrix and multi-matrix are all available from the Cy-RCP’s paint menus. Camera setup can also be handled remotely. A single Cy- RCP can handle an unlimited number of cameras, including other cameras such as the full Panasonic PTZ range. Other workflows requiring one RCP per camera are also possible. Tally has been added on both sides. 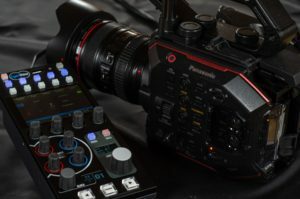 Synchronized record control is next to come, and will be showcased at NAB. Also making its debut at NAB is the Cy-GWY-IO, a mini (little bigger than a matchbox) version of CyanView’s Cy-GWY gateway. It includes 16 x GPI for tally and touchdown, and enables an unlimited number of cameras to be connected. The Cy-GWY-IO provides a cost-effective solution for budget productions using the EVA1-Live or small standalone setups. More information about CyanView and its products is available at http://www.cyanview.com/. CyanView designs and manufactures a universal camera control system consisting of an RCP control panel and small hardware modules that improve and simplify the production workflow. By leveraging IP technologies, CyanView’s solutions address three elements of broadcast acquisition when using a mix of camera types: connection, control, and image quality. CyanView’s universal RCP controller is designed for vision engineers and interfaces with any camera, lenses and other accessories. On the truck side, it also controls video processors for advanced image processing and leverages leading edge colour science in HDR, wide colour space, 4K and high frame rate.